MediZar® Anti-Bacterial / Anti-Microbial Hand Spray Sanitiser is designed as an option to our Personal Hand Foamer Sanitiser. It is certified to kill deadly E.Coli & MRSA within 30 seconds, and will kill 99.9999% of all bacteria, viruses etc which cause workplace and Hospital Acquired Infections. 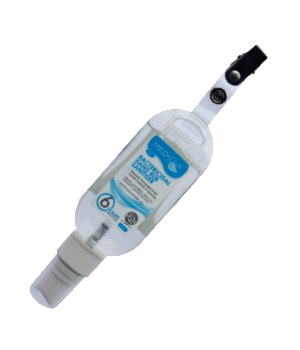 The Hand Spray Sanitiser has a clasp fitting, making it ideal for Healthcare professionals - Doctors, Nurses, Care Assistants etc. It is soft & gentle on the skin, yet extremely effective against deadly bacteria and viruses, and may also be used to treat object such as door handles, utensils and ward furniture. The MediZar® range of products is 100% alcohol free and is supported by full BS/EN (British/European Standards) Certification, and registered for the 2012 EU Biocidal Directive, and is fully compliant. It is gentle on sensitive skin conditions such as eczema and psoriasis, is completely irritant free and has no Hazard Indicators.